Today came across the new application named Tretflix. It’s a ready-to-install operation system that combines the most popular Usenet tools into one package. 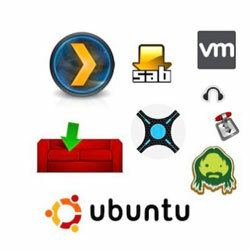 The OS supports services like CouchPotato, NzbDrone, SABnzbd+, Sick Beard, Plex Media server and much more. Tretflix can be used as operation system on your home server, or you can run it on a virtual machine. The software is developed to provide easy installation, setup and management of external applications. The most used Usenet tools are already pre-installed to offer easy configuring of a powerful usenet based media center. Tretflix is able to turn your home into usenet entertainment box within 5 minutes. Tretflix is created for users who search for a quick way to set up an HTPC server. The operation system can be used with a virtual machine of your choise or your own home server in form of a virtual appliance. In other words, we speak here about a pre-built software solution that packages, maintains, updates and manages virtual applications as one unit. Tretflix can be used on VMware vSphere, VMware Infrastructure, VMware Workstation, VMware Fusion, VMware Server and VMware Player. The software is created for users who would like to take all advantages of Usenet and available tools through all-in-one system.